The fourth — and final — dimension of the upcoming Spider-Man game is going to be a symbiote-friendly version of Ultimate Spider-Man. With Spider-Man: Shattered Dimensions' release approaching fast, there's been a lot of speculation about what the final dimension would be. So far, the worlds of Amazing Spider-Man, Spider-Man 2099, and Spider-Man: Noir have managed to generate a lot of excitement amongst Spidey fans. Now that Comic-Con is upon us, Activision has revealed the final setting: that of Ultimate Spider-Man. It might not be as stark a difference as comparing Amazing to 2099, but I assure you, it's there. For starters, Ultimate is completely cel-shaded and Spider-Man's got a much sleeker, younger physique. On top of that, Spider-Man's rocking the black symbiote in this rich and colorful world and not Amazing's red and blue tights. The outfit that would be Venom is cool on a visual level, but the suit actually means that Ultimate Spider-Man plays a lot differently than the other dimensions. ...Whereas in the Noir world - if I did everything right - the villain had no idea I was around, Ultimate had black suit Spidey dropped into the middle of a mess of bad guys. This would've ended with Noir Spider-Man getting blown away in his world, but here, Ultimate Spider-Man just laid waste to these foes with the suit. Spider-Man swings his arms and whips opponents with the symbiote tendrils, he can cause the suit to shoot spikes out of his chest, and the webhead can create impalers that spring from the pavement. Essentially, this sounds like a mix of Spider-Man: Web of Shadows, Prototype, and 2005's Ultimate Spider-Man. 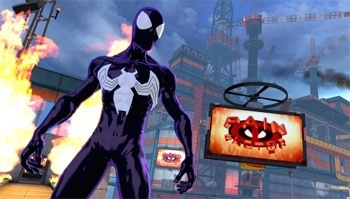 Web of Shadows featured similar melee-friendly play when you shifted to the Symbiote costume, but the attacks described sound like they're straight out of last summer's Prototype. I'm a little underwhelmed by this last revelation. Marvel essentially killed off the Ultimate universe and rebooted it with the awful Ultimatum storyline in 2009. Besides, it hasn't been that long since the Ultimate Spider-Man video game came out. Personally, I think this last dimension was a lazy decision by Activision. Why not let players play as the aged Spidey from Reign, Pavitr Prabhakar from Spider-Man: India, or even Peter Parquagh from the seminal Marvel 1602 world (that took place in Colonial America and had dinosaurs)? What about you? Which version of Spidey were you really hoping to play?